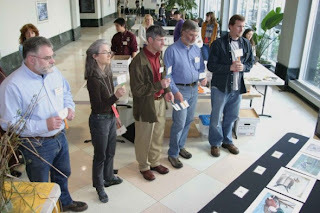 Last Thursday (March 22), I had the opportunity to be a judge for the 2007 Oregon Jr. Federal Duck Stamp Contest held in Portland. There were 803 entries created by students in grades K-12, and 5 judges had to whittle the entries down to one grand prize winner. The talent level was amazing and the task - daunting. The winning entry, which was created by Joy Brenneman, Age 17, from St. Louis Art Studio in Tigard, Oregon, was a Tundra Swan done with chalk pastels on suede mat board. The artwork will now compete against the other state winners in Washington DC for the chance to be represented on the 2008 Junior Federal Duck Stamp and a $5000 prize. Proceeds from the sale of the stamp support conservation education and provide awards and scholarships for the students, teachers, and schools that participate in the program. Best of Luck Joy! Pictured from the left are the 5 judges: Mark Nebeker (Oregon Dept. of Fish & Wildlife), Eve Prior (The Nature Conservancy), Mike Marxen (US Fish & Wildlife Service), Fred Paveglio (US Fish & Wildlife Service), and me. Not pictured is Pam Johnson (Oregon Coast NWR Complex) who has does an amazing job coordinating the competition over the years. I have spent the better part of the last few days creating remarques on prints. For those who aren't familiar a remarque, it is a tiny original painting on the border of a limited edition print. It is a unique way to increase the value of your print and to own a small original artwork at the same time. As an artist, these are challenging because they are so small - often within a 1"x2" area - but fun to do because I am able to create quicker completed paintings and experiment with composition. The painting to the left was published by Idaho Ducks Unlimited (DU)as a limited edition print, and I recently donated one of the Artist's Proofs to the Astoria, Oregon chapter of DU. The print sold for $475 at auction! The money generated by the sale of the print will be used by DU to enhance and purchase wetland acreage. Donating artwork to conservation groups is something that I have done passionately for nearly a decade (and will continue to do so), and during that time my art has raised nearly $400,000 for conservation efforts throughout North America. An incredible group art show runs through Friday at Gallery One in Mentor, OH. It's called Masterworks in Miniature and features works by Robert Bateman, Carl Brenders, Terry Isaac, Rod Frederick, David Maass and many others. My painting, 'Spring Chickens' (left) has been included in this years show. It is unique in that people submit an 'intent to purchase' slip for their favorite works and will not know if the won their painting until the drawing March 24th! I just got back from a trip to the desert with my son, nephew and sister. We took in some Spring Training games and made a trip to the zoo. I got some great desert reference photos and some incredible shots from the Phoenix Zoo. I do use captive animals as reference sometimes - it is awfully hard to see an animal like a bobcat in the wild (although I have) and get a sketch done or photo taken. They are so secretive and very shy. Mountain lions are the same way. Zoos provide a great place to study these animals and learn their anatomy. However, an artist has to be careful not to include the body structure of a captive animal though. Wild animals are very lean and muscular. 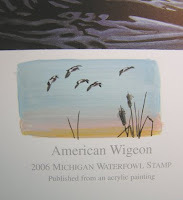 Each year I try to enter a few duck stamp competitions. 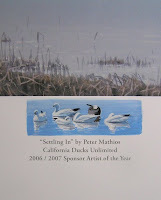 My first entry in 2007 is to the Colorado Duck Stamp Contest. I have never entered this competition before but the subject matter this year was too tempting to pass up. The Division of Wildlife selected hooded mergansers (one male and one female) in a Colorado setting and the painting to the left is what I came up with. I focused on the movement of the water to help move the viewer's eye from bird to bird and throughout the painting. These ducks are commonly found on rivers and streams during the cold winter months. I submitted the painting last Friday and should find out the results of the competition by early April. Duck stamp competitions are difficult to win because every artist submits the same species and each artist is very talented! With this painting I was really trying to be different and stand apart from other entries. I just got back from a trip down to the wetlands that border Oregon and California. I started out at Shasta Wildlife Management Area, and thanks to Mike McVey the assistant manager, I was able to have full access to the property including a vehicle. All in all, I scoped 42 species of birds on the area and did a lot of sketching and photographing. The area also boasts quite a deer population and I was able to get great mule deer reference although the bucks had just shed their antlers. A cougar was also on the property the day I was there! The picture to the left is of majestic Mount Shasta being graced by some migrating waterfowl. The next day I headed up into the Klamath Basin to get some photographs and was able to witness the arrival of migrating snow, ross, and white-fronted geese. The area was still snow bound but the ponds were thawed. Bald eagles were everywhere!